Looking to boost your SEO in 2019? Try this list of actionable, easy‐to‐understand SEO techniques on for size. In this post, we do away with ambiguity and focus on a handful of actionable SEO techniques that get results. Let’s go. Let’s say that you rank #1 for a keyword with thousands of monthly searches. You won’t get traffic unless people actually click on your page in the search results. That’s why it’s important to optimize for clicks. But how? An example of how the meta title and description look in Google’s search results. … and they’re all you have to win to click. But here’s the thing: no matter how hard you try to get this right, things won’t always work out. 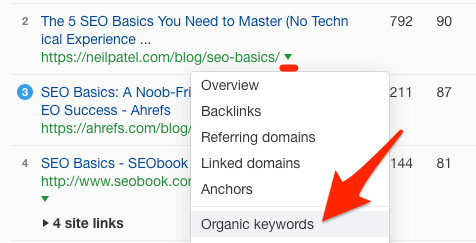 To do this, use the Organic keywords report in Ahrefs Site Explorer. 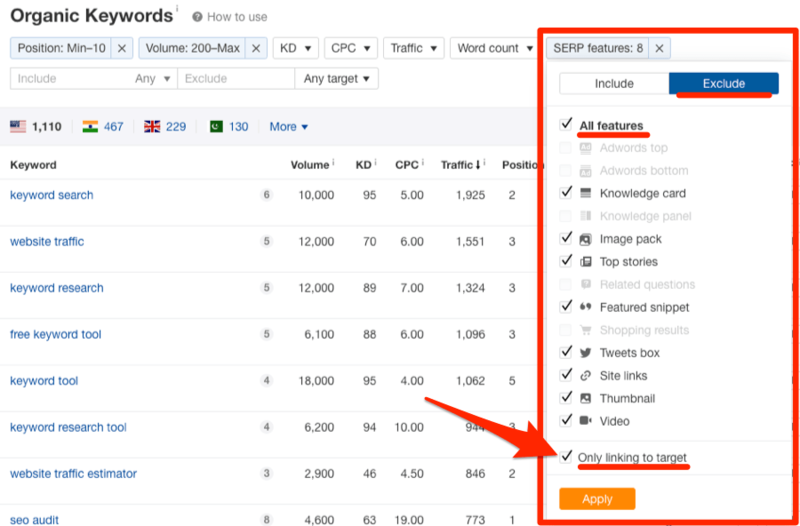 This report shows all the keywords for which your site ranks. Just over 60,000 in this case. Now, we’re only interested in first‐page rankings as that’s where our efforts will have the most significant impact. So before doing anything else, let’s filter the report for first‐page rankings. Let’s also filter for keywords with search volumes of 200 or more. That will weed out the keywords with little to no traffic potential. This number is somewhat arbitrary. Feel free to use a higher or lower threshold. Finally, we’ll exclude all owned SERP features. Next, export the data to CSV. This shows the pages where you stand to gain the most by improving CTR. These are the ones you should aim to improve. 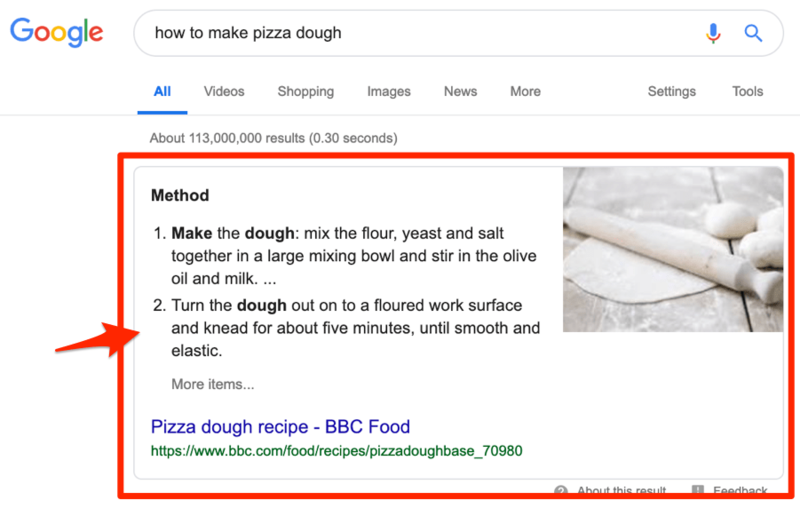 Even though we excluded owned SERP features, it’s important to note that the presence of SERP features (e.g., featured snippets) in the SERP can affect the CTR of the “regular” organic results. Furthermore, the calculations in the spreadsheet are based on CTR averages. As such, always take the results with a pinch of salt and investigate further before adjusting titles and descriptions. There may be a legitimate reason for lower than average CTRs such as the presence of SERP features, or the fact that the keyword is branded. Remember that CTR varies on a keyword‐by‐keyword basis. But here’s the thing: the average CTR for position #1 is ~27% for unbranded keywords in the US, and ~15% for position #2. So we’re performing well below average here. That’s a traffic increase of 176%! Internal links are backlinks from other pages on the same website. The blue words in this sentence form an internal link to our anchor text guide. Why are they important? Because they aid the flow of “authority” around your website. Many also believe that internal link anchors (the clickable words) influence Google rankings. This is something that Google’s John Mueller has all but confirmed on a few occasions. Now, it’s important to note that you should have a good internal linking structure to begin with. But sometimes, you might want to boost certain pages with internal links. For this process, I’m going to assume that you already have a list of keywords for which you want to rank. If you don’t have this, well, I recommend checking out our SEO basics guide, because that’s SEO 101. Got it? Paste the list into Ahrefs Rank Tracker. This tells you where you rank for each keyword in your target country. It’s important to note that you don’t need to paste every keyword variation in here. Just paste in the main target keyword for each of your pages and posts. Next, filter for keyword rankings in positions 2–5. It’s also worth excluding your SERP feature rankings, just to give a clean data set to work with. You should now be left with a list of keywords for which you currently rank in positions 2–5. 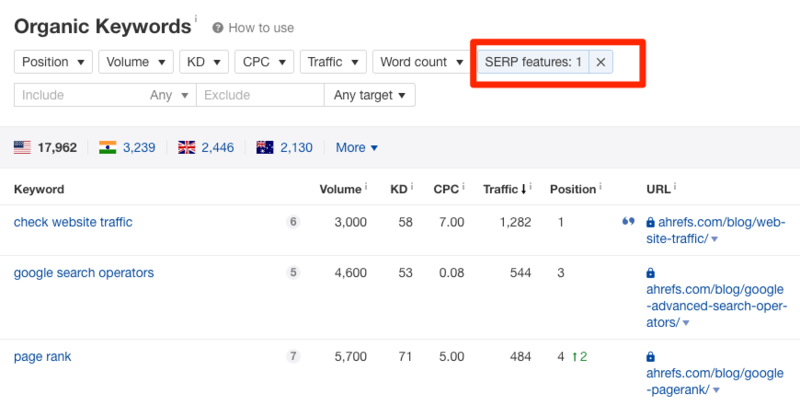 By default, the list of keywords in Rank Tracker is sorted by estimated organic traffic from high to low, meaning that the keywords sending the most traffic to your site are at the top of the list. … and this is from ranking in position 3! So imagine how much more traffic we could get from that keyword if we ranked just one position higher! Probably lots more, right? Here, we can see that the page ranking above us gets an estimated 494 visits per month from the keyword “SEO basics” vs. our 400. That’s 23.5% more! Conclusion: If we could somehow boost the ranking of our page from position 3 → 2, then we’d see a ~23.5% increase in traffic from this keyword! 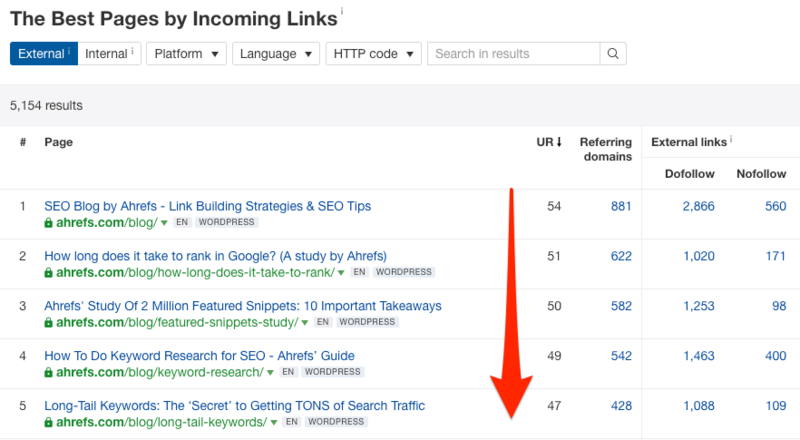 If we can boost the “authority” of the page through internal linking, chances are we’ll boost rankings for some of those other keywords too… which means even more traffic! Got a page that would benefit from a boost? Keep reading. Similar search intent: If you’re trying to rank a blog post, then it’s best if the page above you is also a blog post, not a product page. 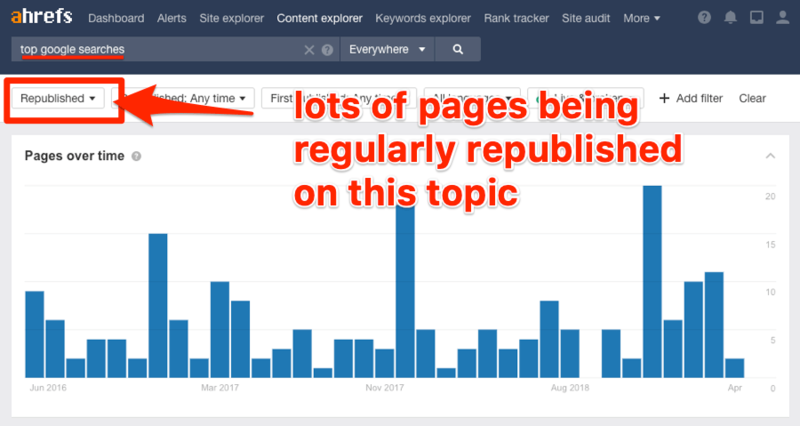 Roughly the same URL Rating (UR): URL rating is Ahrefs’ proprietary metric indicating the “authority” of the page. If the page ranking above you has a drastically higher UR score, then you may need to point a lot of powerful internal links at your page to outrank it. Now we have a suitable page to boost, we need to find suitable places from which to add internal links to that page. There are two ways to do this. This finds all the pages on your site that mention the phrase somewhere in the copy. In other words, contextual internal linking opportunities. Looks like this would be a good place from which to add an internal link to our guide. 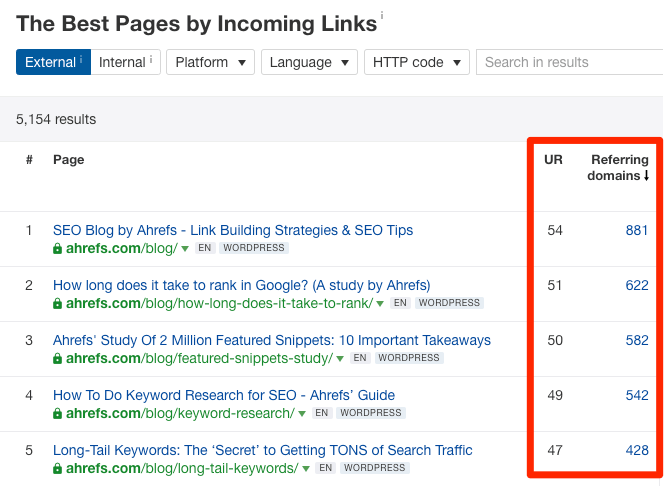 Go to Ahrefs Site Explorer, enter your domain, then check the Best by links report. This report is sorted by URL Rating (UR) by default so it shows the most “authoritative” pages on your site. In other words, a list of pages from which an internal link could transfer a decent chunk of authority. Skim the list looking for topically‐relevant opportunities. This page has lots of authority, and it’s also about link building—a subtopic of SEO. If we look at the page, it doesn’t take long to find the perfect contextual internal linking opportunity. Backlinks aren’t always easy to acquire. In fact, they rarely are. If you’ve spent time, effort, and possibly cold hard cash building links, it pays to ensure that they’re not pointing to dead pages. Such links are effectively wasted. 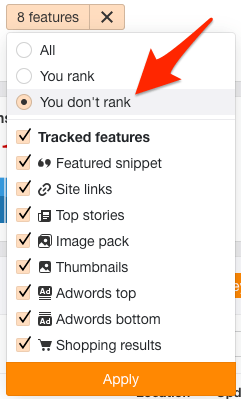 To do this, use the Best by links report in Ahrefs’ Site Explorer. This report will show dead pages with backlinks. Why are these bad? Simple. Dead pages no longer technically exist. They prevent any PageRank (authority) from those backlinks from flowing around your site. Building links ain’t easy, but building links to “money pages” can feel near impossible. 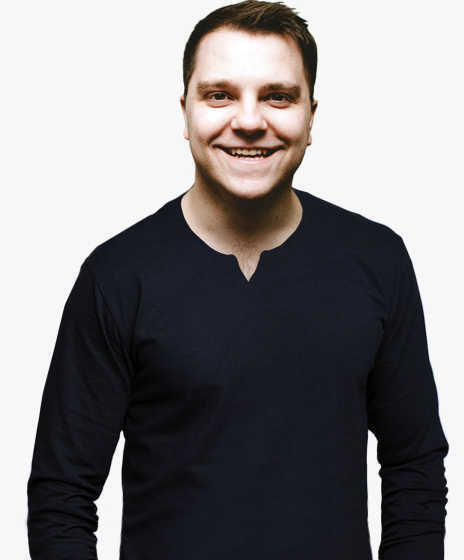 … they’re all a nightmare when it comes to link building. In effect, the blog post becomes the middleman. This is actually an SEO strategy we use at Ahrefs to boost our landing pages. In other words, we link to our Keywords Explorer landing page from within blog posts all the time. And some of our posts have some serious page‐level authority. Now, if you already have informational content related to the “money page” you want to boost, this process is easy. Use the internal linking tactics mentioned in point #3 to find contextually‐relevant opportunities. If you don’t already have such content, then you need to create something that has the potential to earn a fair few links. Learn more about how to execute this strategy here. It’s always preferable to build direct links to your “money” pages if possible. That’s because the middleman takes a cut of “authority.” Not all the link juice gets transferred to your money page via internal links. Some of it flows through other internal links on the page, and some will remain with the page itself. But while this may seem like a negative, that often isn’t the case. That’s because the ‘middleman’ page may rank for informational keywords, which will send more targeted traffic your way. That can be invaluable to your business. 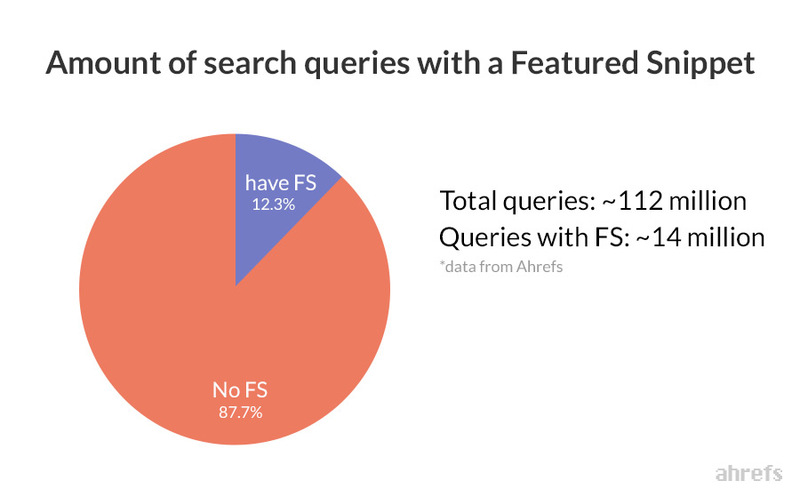 In 2016, we studied 2 million search results and found that featured snippets show up for 12.3% of searches. We also found that 8.6% of clicks go to the snippet. 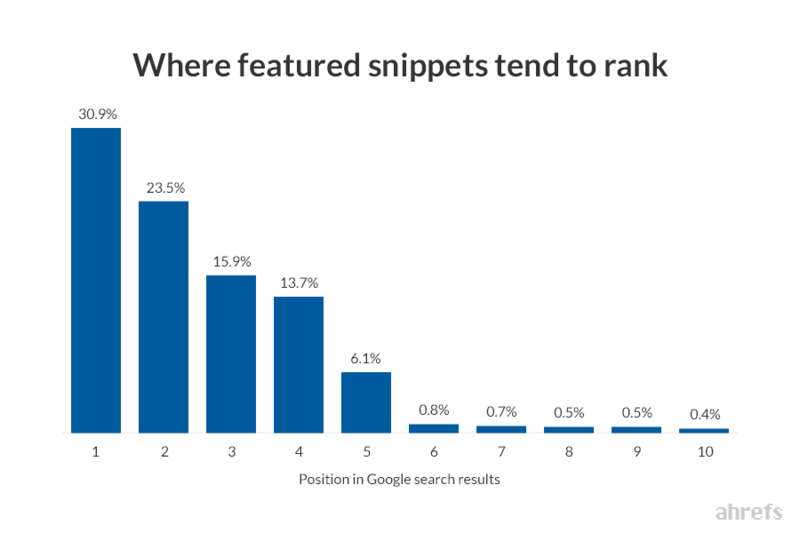 But what you may not have realized is that Google pulls these snippets from sites that already rank in the top 10. And, overwhelmingly, from one of the pages ranking in the top 5 positions. We’re 99.58% certain this is the case. 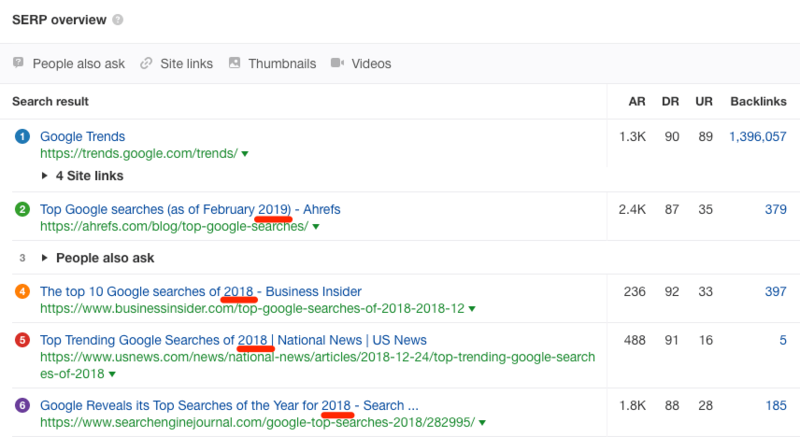 If you rank in the top 10 for a query where Google shows a featured snippet but don’t yet own it, then there’s scope to get more traffic by winning the snippet. 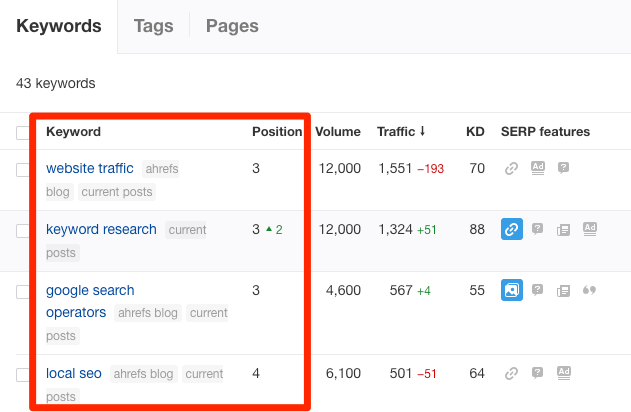 To find such opportunities, use the Organic Keywords report in Ahrefs’ Site Explorer. If you see this symbol, it means you already own the snippet for that keyword. For every other keyword, a competitor owns the snippet and therein lies the opportunity. It’s just a case of trying to understand why they own the snippet and not you, then optimizing accordingly. Now, I’ll be honest; there’s no hard and fast rule here. Still, most of the SEO community seems to agree that to win the snippet, the format of your content needs to align with search intent. 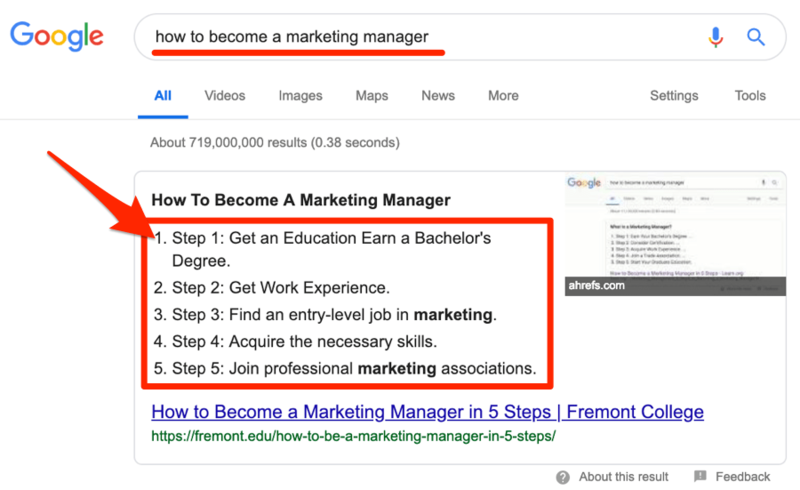 For example, we rank #4 for “how to become a marketing manager,” but don’t own the snippet. That’s likely because people want a step‐by‐step process, as indicated by the current snippet. Our guide isn’t in that format. So, in this case, reformatting that guide as a step‐by‐step process could help to win the snippet. 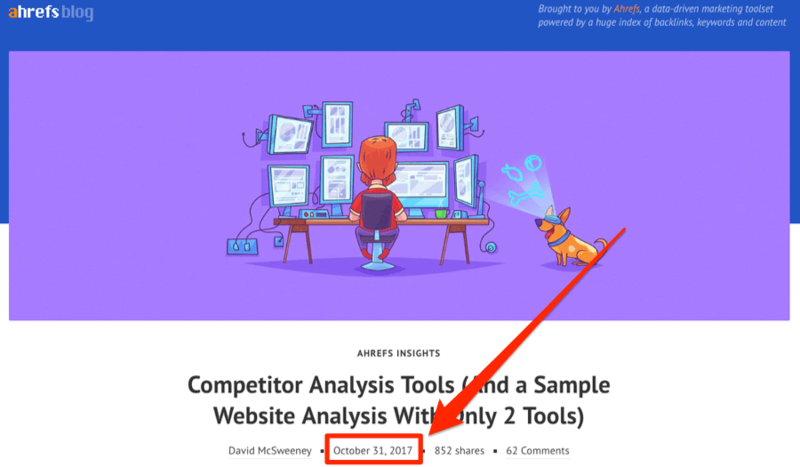 Conclusion: By winning the snippet, we could potentially increase traffic by 200%+. Sometimes content that used to perform well in the search engines ceases to do so. In absolute terms, that meant ~3,000 fewer visits per month coming our way. But some of you likely noticed that after the drop, traffic skyrocketed! That’s because we refreshed and republished the article with new stats and figures. The question is, how do you find posts and pages that are likely to benefit from a content refresh? Let’s face it, this is something that happens over time. So it’s usually old posts and pages that suffer from traffic drops. Try popping a page published over six months ago into Site Explorer, then look at the Organic traffic graph. If the graph drops off like Niagara Falls 🇨🇦, then it’s ripe for a refresh. If you’re a Google Analytics user and would prefer to do this more methodically, then keep reading. What follows is a method for finding these pages at scale. To begin, go Google Analytics and navigate to the Landing pages report. 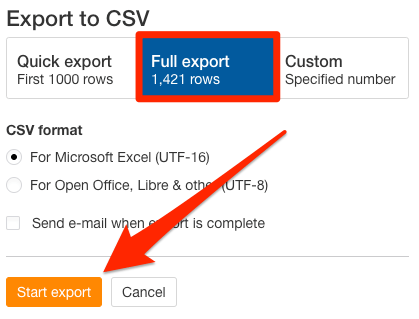 Export the report as a CSV. It’s also worth excluding junk URLs using the inbuilt exclusions filter in Google Analytics. For example, before I exported my report, I excluded URLs containing “?”, “/author/”, and “/category/”. Next, make a copy of this Google Sheets template. Always investigate the reasons behind any traffic drops before rewriting or refreshing content. What this does is compare how last month’s traffic to each page compares with its best month. The results are then sorted in descending order, with the biggest traffic drops first. You can then further investigate the pages with big traffic drops in Site Explorer or Google Analytics. Such things show that Google is prioritizing freshness in the SERP. That may increase the likeliness of a content refresh being successful for that page. You can also search in Content Explorer and filter for republished pages, then look at the trend over time. If people are regularly republishing content on the topic, then it indicates that the topic relies on freshness. In 2018, we analyzed almost a billion web pages. 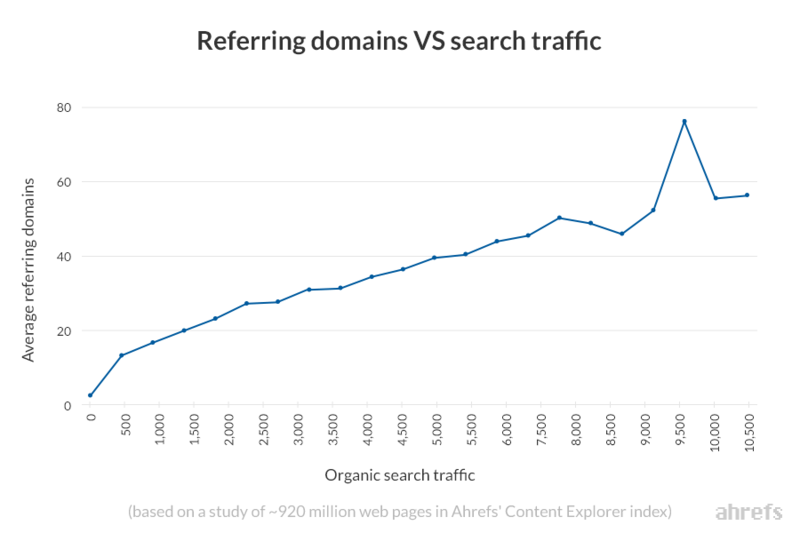 We found a positive correlation between the number of referring domains to a page (links from unique websites) and organic traffic. Translation: the more links a page has, the more organic traffic it’s likely to attract. But here’s the thing: there are outliers to this general rule. Some pages rank and attract tons of search traffic with very few backlinks… or even no backlinks at all. The keywords for which these pages rank are low‐hanging fruit (i.e., topics that you rank for without many backlinks). So how do you find these pages? Content Explorer is a searchable database of over a billion web pages. Enter any word or phrase to see all mentions across the web, plus some useful SEO metrics for each result. That’s 68,300 web pages that mention this phrase! In other words, pages that get a lot of organic traffic without many backlinks. Not seeing results in Content Explorer? Loosen the filter to show pages with up to five, or ten, or twenty referring domains. 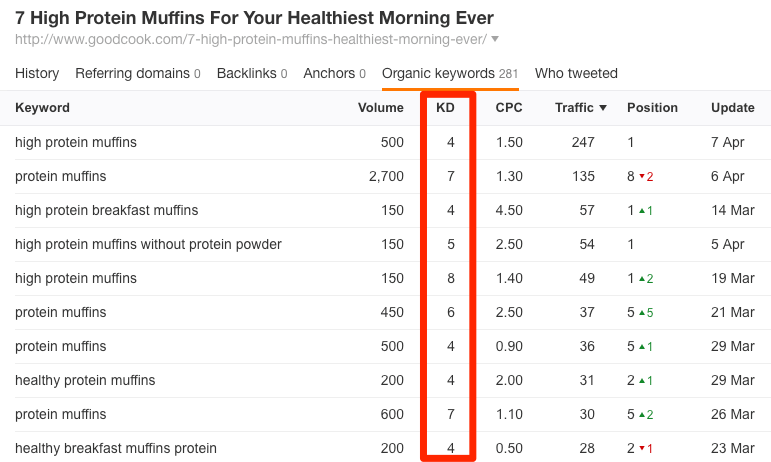 If we hit the “Details” caret and check the “Organic keywords” tab, we see that it’s ranking for keywords related to high protein muffins. And they all have a low Keyword Difficulty (KD) scores. This all but confirms our theory that this is a low‐competition topic. So if you happen to run a fitness‐related site, this topic could be a source of easy traffic. Sometimes people will mention your business online without linking back to you. Unlinked mentions like this can occur for many reasons. But, more often than not, I’d say that it comes down to forgetfulness rather than malice. Now, there are quite a few ways to find unlinked mentions. I wrote a full guide here. But for now, let’s keep things simple and use Content Explorer. This search will return all the pages that mention your brand, many of which will be linked mentions. You can get rid of these by pasting your domain into the “Highlight unlinked mentions” filter. Content Explorer will then highlight pages from sites that have never linked to you. Using the “highlight unlinked domains” filter will include domain‐level links. That means the page in the search results will only be highlighted if there are no links to your website from the entire domain. So, the mention on the page may be an unlinked mention, but we won’t highlight the page if the site already links to you from elsewhere. This is useful because it makes sense to focus on the building of links from new websites. If you want to pursue all opportunities, even those from sites that have linked to you before, then read this. From here, I recommend toggling “one page per domain.” That will ensure that there’s only one page from each site in the results. 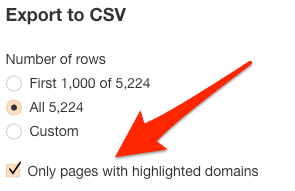 Next, hit “Export” and check the “Only pages with highlighted domains” checkbox. Now, work your way through the sheet and check each of the linking pages. Decide whether you want to pursue the unlinked mention on a case‐by‐case basis. Could make our brand name clickable so people can find our site? Note that most of the links built using this tactic will be homepage links. 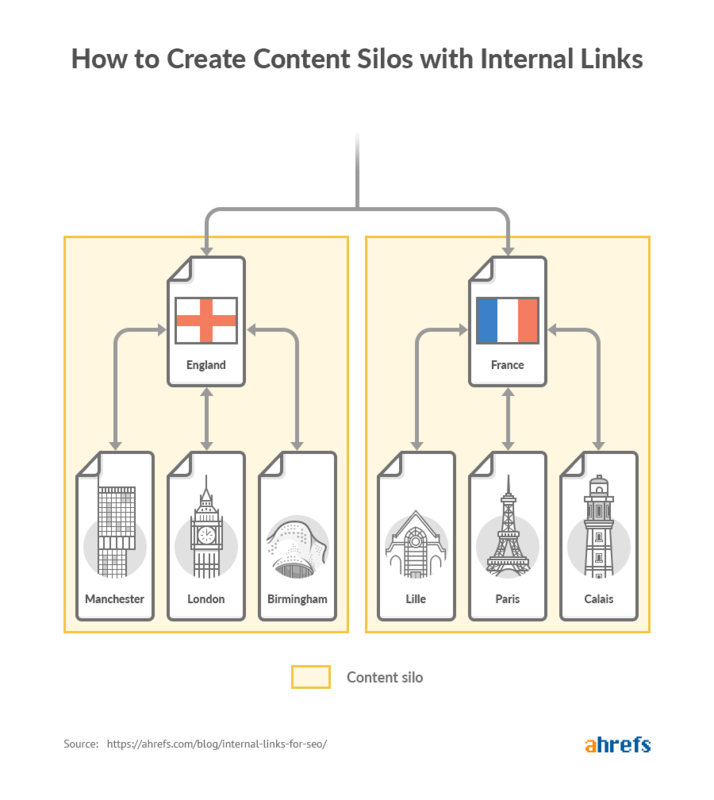 As long as you have a good internal linking structure, that’s a good thing. Some of the “authority” from those links will flow to your other pages. Check back once a month and filter for pages added in the last 30 days for a constant stream of new opportunities. Alternatively, set up a brand alert in Ahrefs Alerts. A content gap is when competitors have content about a topic that you haven’t tackled. For example, the Moz blog, Backlinko, and Yoast.com all have articles about 301 redirects links. We haven’t tackled this topic yet. But content gaps can also occur at the page‐level. To illustrate what I mean, take a look at our guide to doing a competitive analysis. It’s a thorough guide, if not a little old (published late‐2017). We updated this guide since I started working on this post. The guide you see at that URL will be different from the one pictured above. But does it tackle everything it should? This tool looks for keywords that the other pages rank for in the top 100, but we don’t. 16 results, many of which are subtopics that fall under the topic of competitive analysis. The fact that our page doesn’t rank for any of these keywords shows that we’ve likely neglected to mention such things in our guide. Solution: Issue a minor update to the post or page to talk about the things we’re missing. Not only can this help the page to rank for such keywords, but it may also increase the “topical relevance” of the page. In turn, that may boost rankings for other related keywords. What that means: Google is an algorithm. They look at the content on your page to understand what it’s about. By talking about things related to your primary topic, you effectively increase Google’s confidence in what the page is about. Learn more about topical relevance in our guide to on‐page SEO. Most websites have some dead pages, including your competitors. 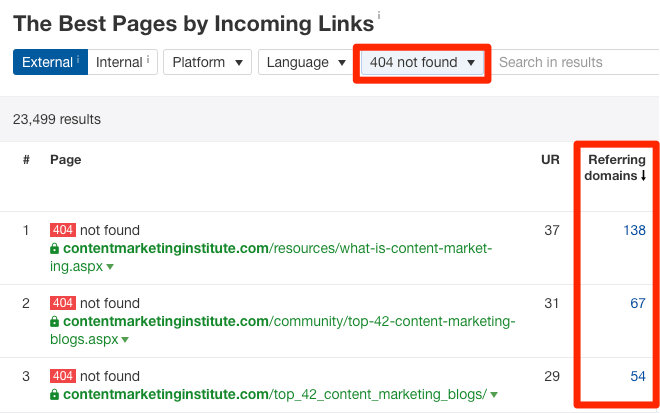 And if your competitors’ dead pages are relevant (or at least semi‐relevant) to your business, and have backlinks, then there’s scope to win those backlinks for yourself. I’ll explain how this works as we go, but first, we need a way to find our competitors dead pages. For that, we can use the Best by links report in Site Explorer. Look at the list of URLs and to see if any are relevant/semi‐relevant to your business. 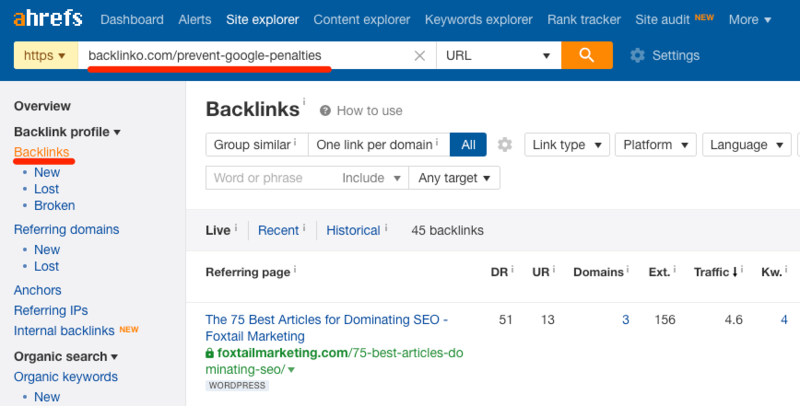 In this case, the topic of avoiding penalties is related to SEO, which is what we talk about on the Ahrefs blog. It has links from 29 referring domains. Let’s hit the caret and click the “View on Archive.org” link to see what it once was. 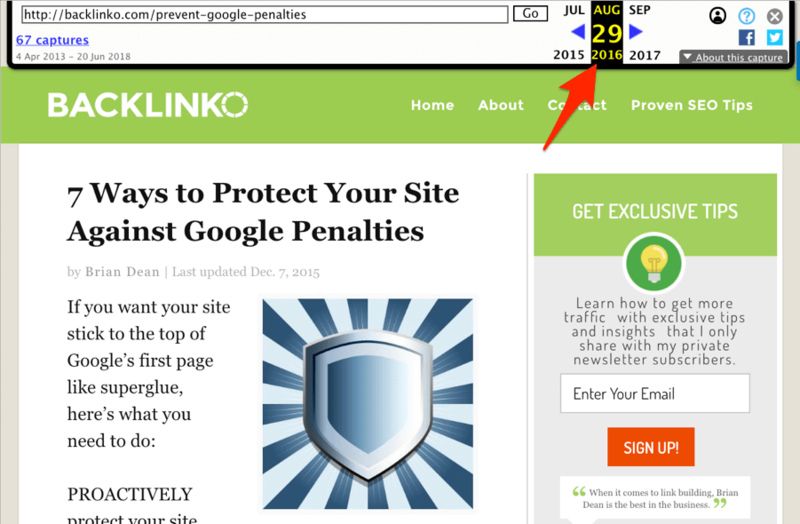 As expected—it was a blog post about avoiding Google penalties. The thing is: because the page is dead, 29 people are now linking to nothing but an error page. This guide talks about pretty much the same thing—how to avoid Google penalties. Not got a relevant replacement already? Create something. Learn more about executing this technique in our full guide to broken link building. Great. Now let’s take a look at the Backlinks report for the dead page in Site Explorer. This effectively gives us a list of people that we can reach out to, and alert about their broken link. But we’re not only going to alert them; we’re also going to kindly suggest our guide as a relevant replacement. There we have it—a list of 17 people from whom we can potentially win links. You might want to swap out the link. Images on the web often get stolen and embedded elsewhere without attribution. Sounds simple, but how do you go about it? Use Pixsy—a free tool that scans the web for occurrences of your images on other websites. So, the obvious starting point is to gather some images to let Pixsy work its magic on. I recommend first compiling any of your owned images that are likely to be popular—infographics, etc. For example, if I were doing this for Ahrefs, I would round up all our branded graphics and pop them in a folder. Next, upload the images to Pixsy. Pixsy will then scan the web for other places the images appear. Looks like they appear on 125 other sites! Now, before we get too excited, it’s worth noting that some of the pages on which these images appear already link back to us. 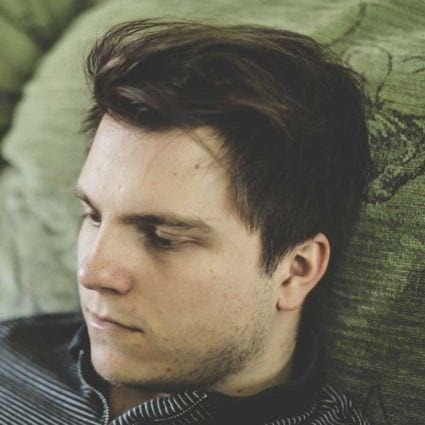 Checking the source code for all the results in Pixsy can be a time‐consuming task. So it’s worth hiring a VA to do this for you. Give them clear instructions and it shouldn’t be a costly job. Alternatively, you can use the custom search function in Screaming Frog. Could you please give us credit with a source link? Using an outreach tool like Buzzstream, Mailshake or Pitchbox should simplify this process. Mail‐merge fields are your friend. SEO techniques are plentiful. This post lists only a few of the many tactics you can use to increase traffic to your website. Still, my hope is that these are actionable and simple enough, even for those new to SEO. Looking for even more actionable ways to improve SEO? Check out our list of 75 SEO tips.